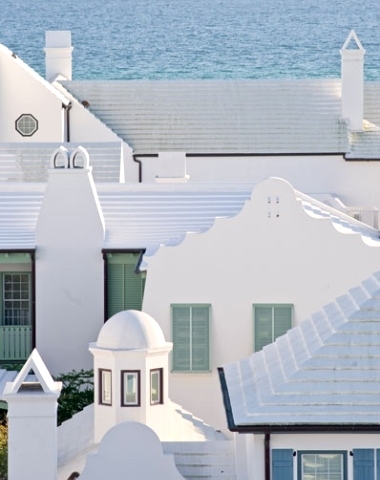 Alys Beach is a planned community in Florida's panhandle that boasts many elegant homes. With their white stucco walls, elements of wrought iron combined with dark wood and private courtyards, Alys Beach homes might remind you of Greek, Caribbean, even Moroccan architecture. 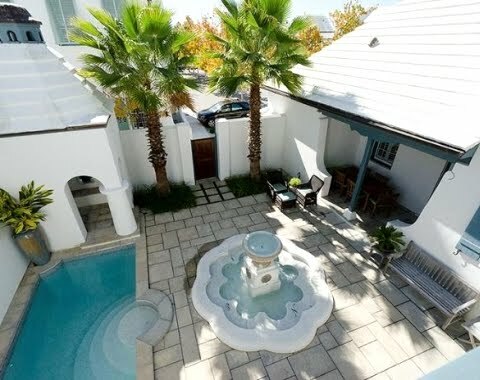 Let's start with the Alys Beach Designer Show House from Traditional Home. 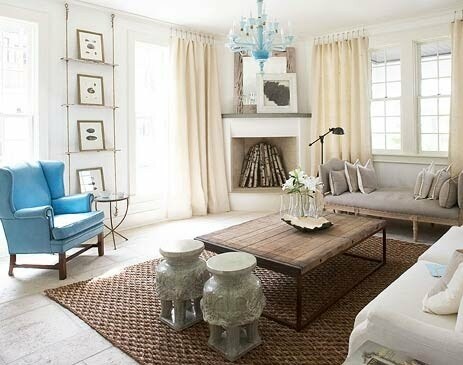 To make it cohesive, the designers involved agreed to use a neutral beach inspired palette with accents of color. To no surprise, most designers chose to bring in a fresh Ocean Blue. Natural materials abound, and an innovative Driftwood Wall Shelf Hung with Rope that is used to display art is part of the scheme. 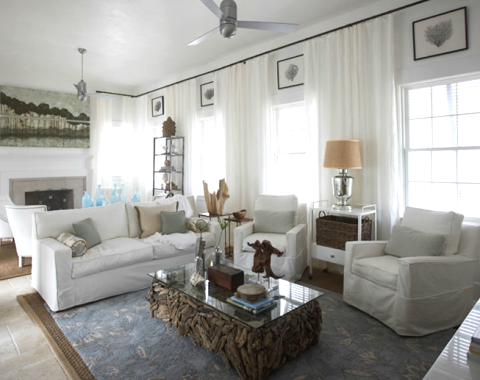 The Alys beach home by GCI Designs was featured in Veranda magazine. All these homes are great examples of how to decorate with white walls. Oceanic Glass Vases are displayed on a shell embellished sofa Table. A show piece this Driftwood Coffee Table is. Framed sea fans are hung high on the wall in between the windows. 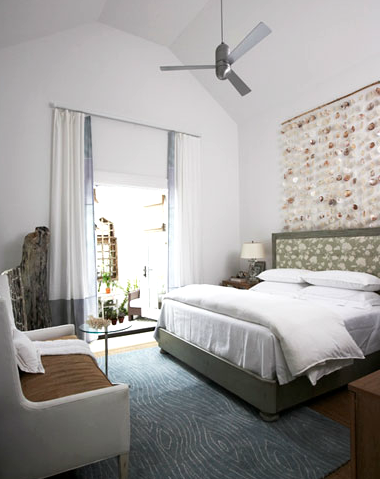 A capiz Shell Wall Hanging decorates the space above the headboard. 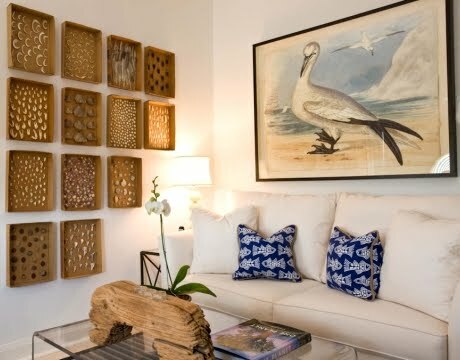 You could make this wall hanigng with Faux Capiz Shells made with Wax Paper Circles. Another Alys beach home by the same group. 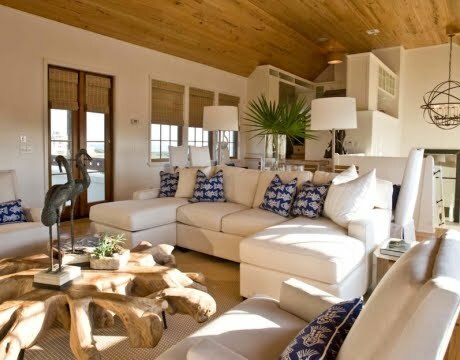 The wood ceiling gives this living room a completely different feel. As wall decor you see Beach Treasures that are Scientifically Displayed in trays. And the large Albatross painting is unique and fun. The bedroom is a warm sea inspired retreat, featuring Seahorse Art. 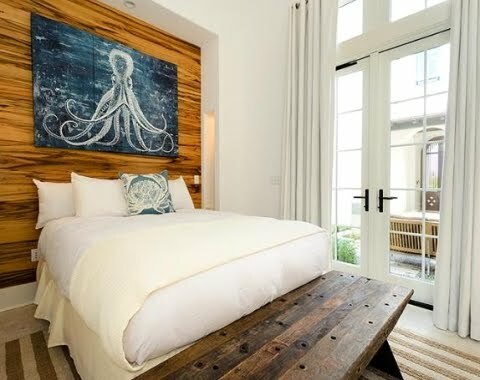 Octopus Art is the focal point in this cozy bedroom. The courtyards of the Alys beach homes provide not only privacy but also shelter from winds. An Alys beach home featured in Atlanta Homes Magazine that plays with bright pops of orange.